Product #60775 | SKU BLENDER | 0.0 (no ratings yet) Thanks for your rating! The TC Helicon BLENDER is a portable 12-input, 8-output mixer and audio interface. It's designed to blend the inputs of six stereo devices, be they tablets, phones, synths, drum machines, laptops, hardware samplers, or indeed, any device with a line/headphone output. The BLENDER sports inputs for six stereo analogue sources. You'll also note the four independently controlled stereo headphone outputs. 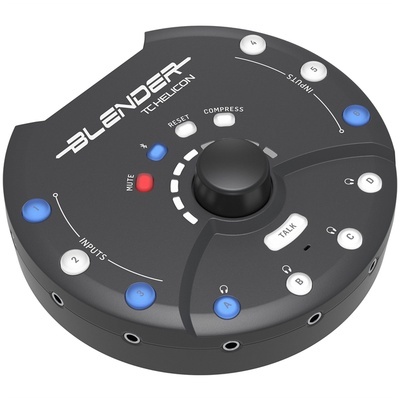 A key feature of the BLENDER is the ability to create personalised mixes for each output, meaning each member of a musical group hooked up to the unit can hear their own custom mix. A Bluetooth connection allows you to control the BLENDER over your phone or tablet. With the free, corresponding iOS/Android app, you can personalise the monitor mix for each musician without having to leapfrog over cables and such. With a built-in omnidirectional microphone, you can communicate easily with your bandmates, even though you're all wearing headphones. Multi-track recording is available over USB at sample rates of 192 kHz, which lets you capture high-quality stereo recordings. A power supply is included with the BLENDER, though it can be operated with batteries. Mute: Press this button to mute the outputs. Bluetooth: Press this button to make the Blender discoverable by Android and iOS devices for use with the control app. Centre Knob: Adjusts the level of the currently selected item. Compress: Press this button to compress and boost the average level for inputs routed to the currently selected output; compression can be engaged and adjusted separately for each output. Talk: Pressing this activates the onboard microphone, allowing some room to be mixed into the outputs. While the Talk button flashes, the level can be adjusted for the currently selected output. If another input or output button is pressed, the talk button remains lit red, though it loses the focus of the centre knob control. Select another output channel, then disengage and re-engage Talk so that it flashes again, enabling the level for that output to be adjusted. Reset: Hold this button for 3 seconds to reset the device to factory default settings.